Chammanthi or Chutneys are inevitable part of Indian Kitchen. My mom used to make different kinds of chutneys and we used to love them. I can still memorize that taste, each kind of chutney she used to make was very unique. This was my favorite, but never got a chance to making it here as I hardly find them in Indian stores. I bought this small dry shrimp from Korean market sometime back and totally forgot about it. So this was on a long weekend in August, when we had a beach trip with our friends to Virginia beach. Heavy rain made our return drive hectic and all were very tired after five hours if drive. We didn't feel like to eat anything from outside and nobody wanted to eat anything heavy as well. So I thought of making 'Kanjhi'(Rice soup/Rice Gruel) which is quick to make and easy to digest for kids. So I just put par-boiled rice to make 'Kanjhi' in a cooker and 'Cherupayar Puzhukku'(Semi Dry Whole Moong) in another one. I wanted to serve some condiments with it, and was browsing for the pickles in the kitchen shelf and found this dry shrimp. I made this Dry shrimp chutney in a jiffy and to my surprise my son loved it having with 'Kanjhi'. I was really satisfied seeing him eating so well. I once again told to myself nothing is as healthy and as tasty as home made food, especially when it comes to kids. So try it out friends and Enjoy!!! Heat up a pan or kadai and dry roast the shrimp till crisp(don't get to to dark brown). Set aside and let it cool. Coarse grind(Chathakkuka) together all the ingredients and roasted shrimp without adding any water. Move to a serving bowl and serve with boiled rice/Rice Gruel/Kanjhi. Enjoy!!!!! Note:- You can just crush all the ingredients with roasted dry shrimp in a mortar with a pestle and serve, that tastes better if compared . I coarse ground it in a mixer since my daughter is not even two, so was worried it might stuck in her throat. 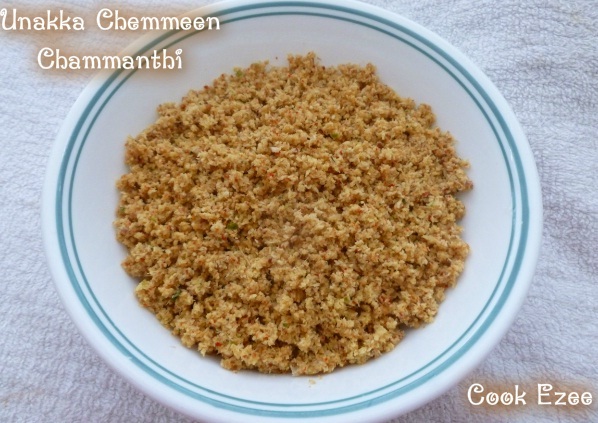 Delicious chamanthi..My mom used to prepare it,I liked it with plain hot steamed rice!! @Torview:- thanks ya, u have a great space too.